Okay, first of all, I want to say this is my favorite photo of me in a long time and it’s kind of funny that it is since you can’t see my face. But the reason why I love it so much is because it is so ME. This is who I am. 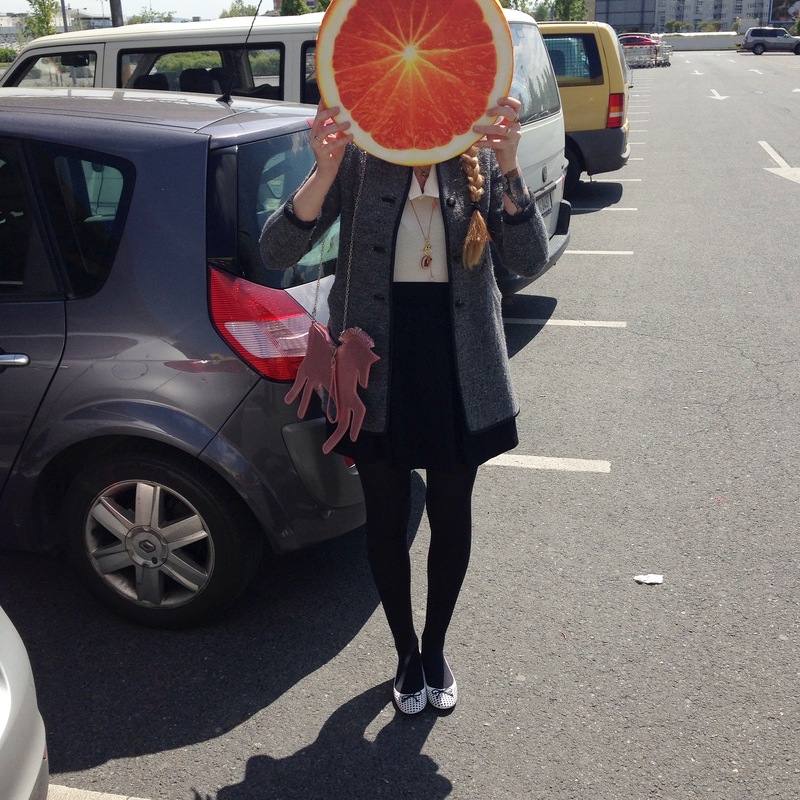 I’m the wacky kooky girl that poses with a orange slice shaped seat cushion in a parking lot after having gone food shopping. 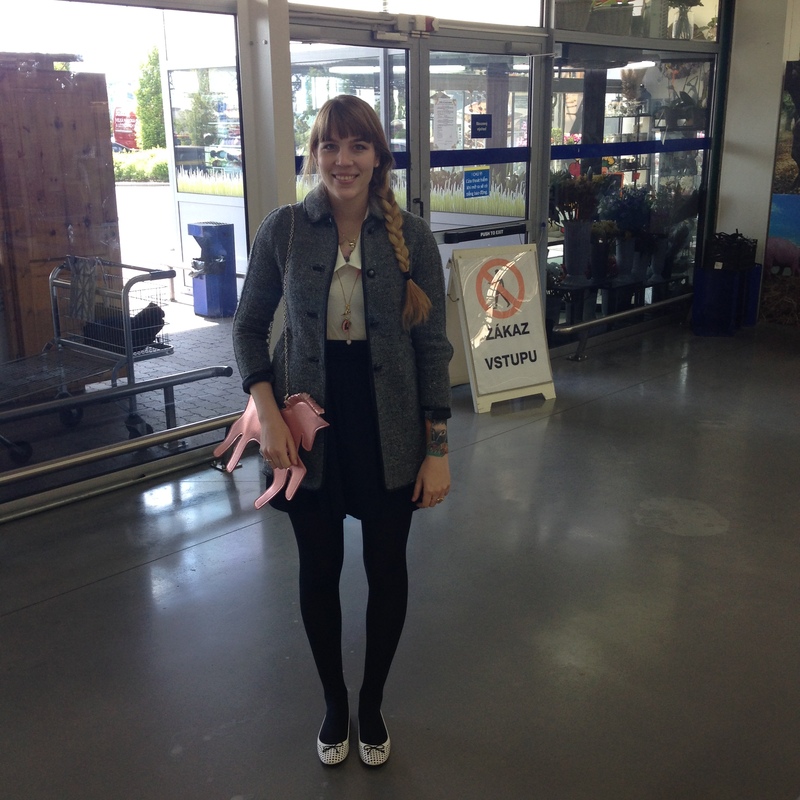 Yes, I wore this gorgeous outfit to go food shopping. Over dressed? Definitely but it was a state holiday (last Friday) and I had some time to have fun with my outfit and I went with M, so I had someone to take my photo. Most of my daily outfits don’t get documented because all of my photos are iphone photos and I usually need someone (M) to take my picture. That aside, though I do love the silliness of the orange seat cushion, I really love this outfit by itself too. You may recall these shoes from my things I bought in Rome post, they are flat ballerina shoes with cut-outs from Zara. 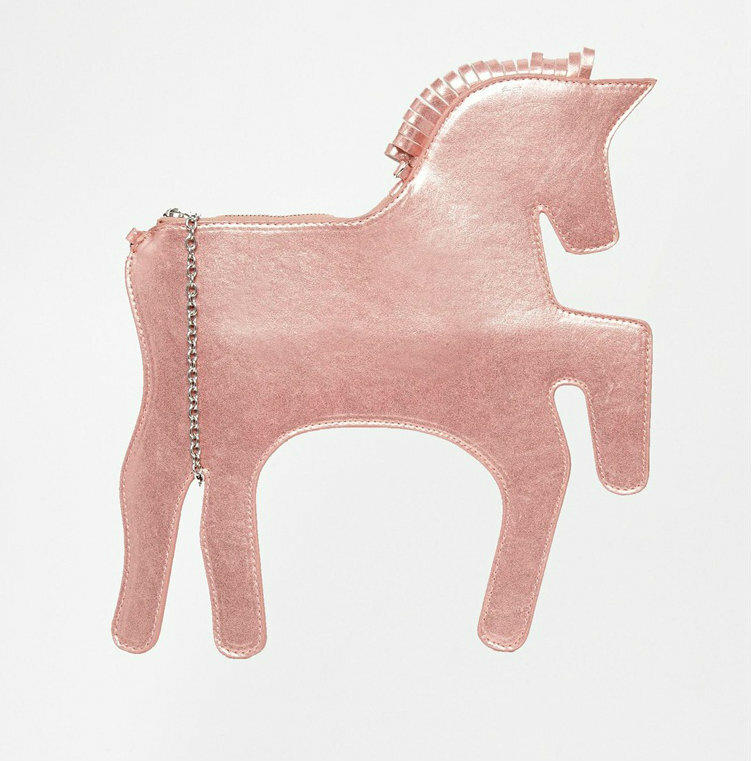 My unicorn clutch bag is from The Whitepepper and it’s the pink version (it also comes in black but I really loved the pink version). I bought it from Asos. This was the first time I’ve worn it I think. I saw a lot of versions of this bag on ebay but I just really wanted the real thing so I ordered this one from Asos. It doesn’t fit much (most of my clutch bags don’t) but I still really like it. The rest of my outfit was a sleeveless top from H&M, my current favorite skirt also from H&M (very old, I’ve had this skirt forever it seems). Oh and I also wore a necklace from Johnny Loves Rosie. I’ve been better with wearing accessories lately (I always have more fun with fashion in the Spring and Summer) and I’ve been waiting for the perfect outfit to pair with this necklace. It has a bunch of different charms and my favorite is the wooden birdcage and then there’s a little lock, which is just so cute. The pink details of it tied in nicely with my pink bag. This is a really cute outfit. I got the same bag from ASOS, but mine was quite marked on one side from packaging/tags etc Just little dents and lines all over the place, but it had sold out and I loved it too much to return it. It looks like it fits hardly anything inside though, ridiculous! Haha. 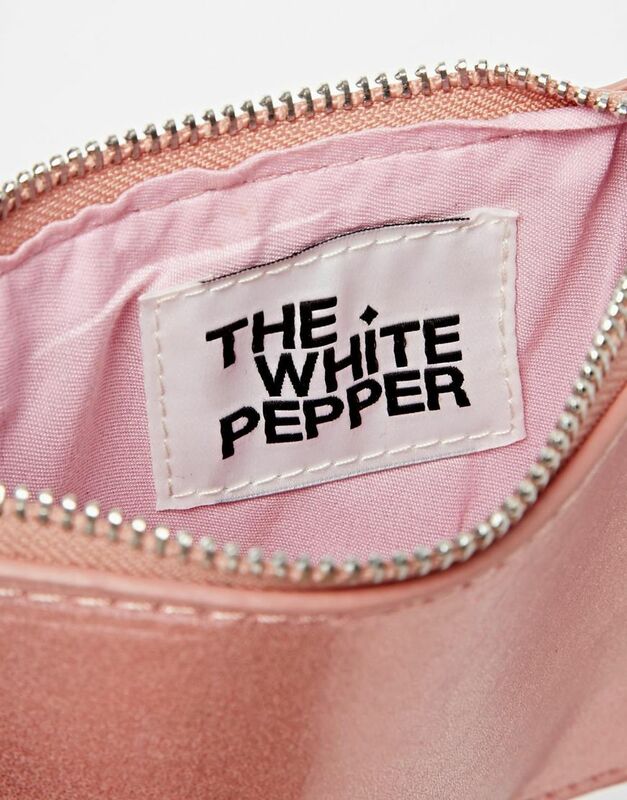 I’m annoyed because I’ve just watched The Whitepepper boat one sell out…£40 was too much though for a bag that barely holds anything, especially as I’m worried it might arrive less than perfect too (and my uni was in the sale). Mine was bought in the sale too and it also arrived with little dents/scratches on it and I was super annoyed at first but then I got over it and at least I wasn’t worried about wearing it out. Since it already wasn’t in perfect condition. I wouldn’t have paid full price for it though! I thought the orange was a bag at first and immediately went into extreme bag lust. Hehehe.